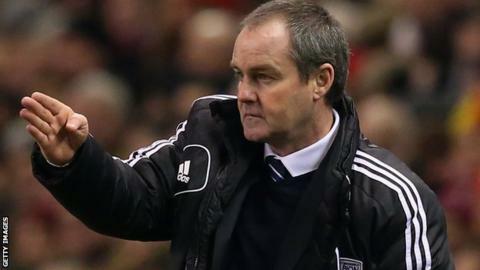 West Brom boss Steve Clarke is still only focusing on Premier League survival, despite overtaking Liverpool into eighth in the table. The Baggies beat Liverpool 2-0 at Anfield to move onto 37 points but Clarke is not looking too far ahead. "I said from the start '40 points, first target' and we are almost there," said the Scot. "No-one was talking about Europe before, everyone was thinking where we were getting our next win from." The Baggies had lost five of their last six matches before Monday's match but two goals in the last 10 minutes secured their first win since Boxing Day. Goalkeeper Ben Foster pulled off several fine saves to keep out the home side, including a disputed penalty from Liverpool captain Steven Gerrard. "When he [Foster] made that save from the penalty that should never have been given, I think it gave us a positive momentum and a little bit of belief to go and win the game," former Reds coach Clarke said. "We need one more win to get 40 points and we have 12 games left. "Hopefully we will get it quickly and then we'll see where we end up at the end of the season."